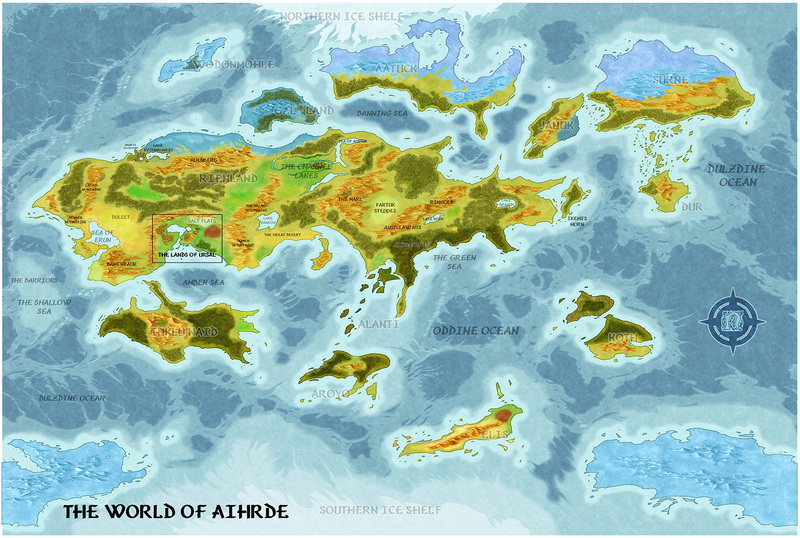 Aihrde is large world, nearly 24,000 miles in circumference. The world possesses vast oceans and seas, one primary continent and five smaller continents. Her south and north poles are covered in thick sheets of ice year-round. It is a land of wild adventure, peopled by the fierce Aenochians and their mortal enemies the Ehtrum, Elves of the Lands of Seven Rivers, Halflings, and the Earagoth, the First Born, the Dwarves. Upon her many shores are monsters from the madness of dawn's creations, dragons, giants and beasts of fierce design. It is an a world of Epic adventure with over 15,000 years of recorded history.